My daughter cleaning and lubing a chain. 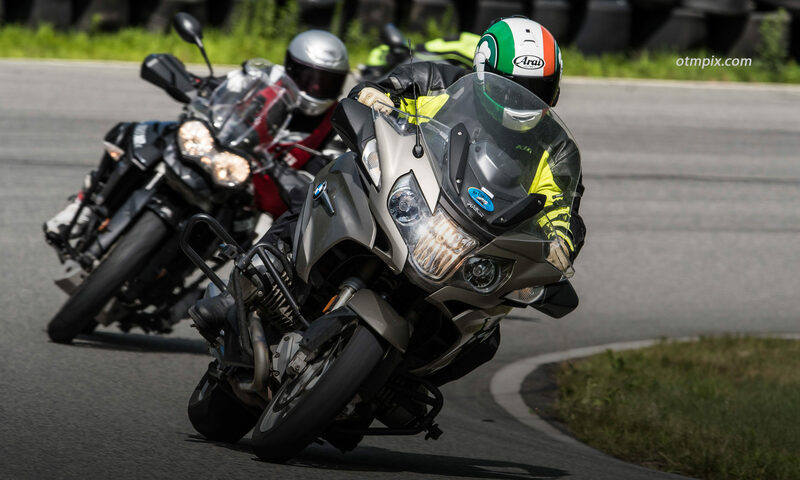 Motorcycling is much more than simply owning a two-wheeler. It also means learning to ride well enough to be safe and having the ability to maintain your motorcycle so that the machine you straddle is in top-notch condition. This is not a trivial requirement. Stories abound of hapless riders falling victim to incidents caused by ill-maintained motorcycles. Failure to lubricate, air-up, tighten or replace certain parts can lead to painful and expensive mishaps that could have been avoided with a bit of preventive maintenance. New riders can easily become discouraged once they realize that it is time and cost-prohibitive to bring their motorcycle to their local repair shop or dealer to perform frequent chores. It just makes sense to learn how to lube and adjust your chain, change your oil and perform small adjustments that need attention from time to time. It also makes sense to have the ability to bolt on accessories. The good news is that it’s not difficult to learn how to be self-sufficient. And once you start getting your hands dirty you’ll find a deeper connection with your motorcycle (and with riding). Once you adopt these basic principals, the next step is to find your owner’s manual and buy a bike-specific repair manual so you can know what is involved with a particular project. Some jobs are better left to the pros, but a surprising number of tasks are very doable by an adventurous owner. Below is a basic list of tips I put together that will help get you started. Note: This article contains links from Bike Bandit. I usually turn down these sponsored post offers, but I said yes because I have been using them for years as my go-to source for OEM (original equipment) parts and other goodies. Although this post is sponsored, all opinions are my own. Really. When my daughter was old enough to hold a wrench, I made sure to include her in some basic maintenance chores. She resisted at the time, but she now thanks me. She is not afraid to tackle maintenance chores partly because I exposed her to what it feels like to simply turn wrenches and screwdrivers on various fasteners and components. The first thing she needed to learn is the law of “lefty loosey, righty tighty”. If a nut or bolt won’t seem to budge, first confirm that you’re turning it the right way. Believe me, this happens all the time with newbies. There is a difference between a #2 and #3 Phillips screw driver. Asking a #2 to loosen a tight #3 screw may work out, but don’t be surprised if you then have to deal with a bunged screw head. Having a set of extractors, vice-grips and taps might save the day. Maybe. Get a comprehensive set of metric (or SAE for you American bike owners) sockets and wrenches so you avoid using adjustable wrenches and pliers, which often make your job downright miserable. Speaking of tough nuts…Many people struggle because they don’t know how much force is needed to loosen a stubborn nut, screw or bolt. The right amount of oomph needed to get a fastener undone becomes a “sense”. I can usually feel when a bolt is about to strip (damage threads) or break (sh*t). This comes from experience. But, don’t be deterred. As long as you have the right sized tool (no adjustable wrenches, please) and follow the law of “lefty loosey, righty tighty” then go for it. Just be sure to maintain pressure where the tool meets the fastener so it doesn’t slip on the screw, nut or bolt head. If it still won’t budge, give it a squirt of Liquid Wrench and let it sit a bit, or apply heat for really stubborn fasteners. If it still won’t give, then clamp on a pair of vice-grips and give it a go. If you are still having trouble, you’re going to need help from someone who can extract the boogered fastener. Or keep at it yourself. Expect to use swear words not heard since your college days. @#%&@* It will eventually come out. Have faith. You will be a more daring and successful mechanic if you learn how a motorcycle’s brake, drive, electrical, and control systems work. It will make more sense why the manual says to remove the whatchamajigger if you know its relationship within the system. You will also be better able to diagnose problems if you know that the thingamajig drives the whatsahoozit. There are lots of online articles to help with this, and to walk you through specific jobs. You can also take a look at the series of videos from the MC Garage that cover many of the basic maintenance tasks faced by us motorcycle riders. If you plan on doing more complex tasks like valve adjustments, you’d be smart to learn how the engine works, but it’s not necessary for most maintenance chores. Let’s say you learned that you need to replace your chain and sprockets, air filter or clutch cable. You can go to your local dealer to buy parts, or you can choose to shop online without leaving your living room. I am a big supporter of my local dealers, but I sometimes feel like they are little more than middlemen between me and the parts distributor. However, if you’re new to this whole motorcycle fixing thing, a knowledgable dealer can offer advice and guidance not easily accessed from online retailers. Also, delivery can be shorter if I ordered parts online myself and had them delivered directly to my door. Bike Bandit has delivered prompt service time and again. Even if I end up buying from my dealer, I regularly use their online parts microfiche to learn about the project and make sure all the right parts are ordered. Their search function gets me to the correct page quickly. They also have a “My Garage” list to quickly find parts that fit the bikes I own. While I am ordering maintenance parts I usually end up shopping for other goodies like motorcycle accessories or motorcycle gear. Much of my accessory shopping is done at Twisted Throttle, but I always seem to have some “Bandit Bucks” to spend, so I end up adding something to my order. Besides, Bike Bandit has gear and accessories that Twisted doesn’t carry. I find Bike Bandit easy to work with and their selection is very good. Check them out at www.bikebandit.com. I try… I ask “experts” and I do things that I never would have considered. Converted my bike to super bright LED. Remoted an oil pressure gauge. Changed my seat and bolted on accessories. The more I did the more confident I became. I’ll never do major work that requires a lift and more than an afternoon. But it is fun; the only down side is it keeps me from riding! A small price to pay knowing the bike is safe mechanically. Always learning. Another excellent resource is a copy of Mark Zimmerman’s popular book, THE ESSENTIAL GUIDE TO MOTORCYCLE MAINTENANCE, originally published by Whitehorse Press. That old “lefty loosey, righty tighty” mantra is seriously flawed. Sure, it works when you are 1. straight up looking at the nut, and 2. thinking about the wrench movement at the TOP of the nut, i.e. moving right, from 9 am thru 12 noon to 3 pm. When you are in an extremely twisted, upside down approach to the nut, who’s to say what is left and what is right? And what if your brain thinks of the wrench moving at the BOTTOM of the nut? Move left, from 3 am through 6 am to 9 am and you won’t be “lefty loosey-ing” that poor nut! You’ll be cursing at it when it shreds under the pressure. I was thinking the same thing. The lefty loosey concept is not flawed, but it does need to be adapted for the situation. Thanks for that tip about hard nuts to turn. I too have forgotten the left loosey rule. I’ve been thinking about getting lessons to ride, because I’ve always wanted a motorbike. Thanks for the tips on how you can be better at motorcycle maintenance. To me, having a reliable source of motorcycle parts is a huge deal because it means you can get the parts you need, when you need them. My brother bought a Triumph and he wants to baby that thing and make sure he takes care of it; I will be sure to share this with him.